Come hear the new music that is the subject of our soon-to-launch podcast series Dispatches from the Unknown and get the inside track on this exciting new project. In each episode, we travel through one artist’s creative mind and learn about their new music as it unfolds. We hear about who they are and why they create, explore the inner workings of their creative process, and more. Composer and improvisor Anna Webber is an integral part of a new wave of the Brooklyn avant-garde jazz scene. A saxophonist and flutist who persistently avoids the expected, Webber’s most recent album, SIMPLE (Skirl Records, 2014), has garnered much critical acclaim including several Best-of-2014 lists. 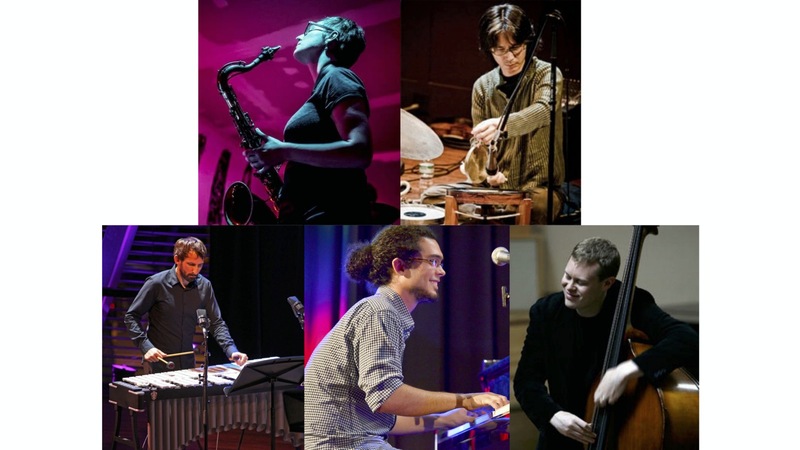 In addition to the SIMPLE trio, Webber also leads a septet, Percussive Mechanics, with which she has released two albums on Pirouet Records: Refraction (2014) and Percussive Mechanics (2013). In 2014 she won the BMI Foundation Charlie Parker Composition Prize as a member of the BMI Jazz Composers’ Workshop. She is the winner of the 2010 Prix François-Marcaurelle at the OFF Festival of Jazz in Montreal. She has been awarded grants from the Conseil des arts et des lettres du Québec and the Canada Council for the Arts and residencies from the Brush Creek Foundation for the Arts and the Millay Colony for the Arts. Originally from British Columbia, Webber studied music at McGill University in Montreal before moving to New York City in 2008. She holds master’s degrees from both Manhattan School of Music and the Jazz Institute Berlin. Her teachers have included John Hollenbeck, Jason Moran, Mark Turner, and George Garzone. Pianist and composer Fabian Almazan found his musical roots as a child in his homeland of Havana where he first became involved in the classical piano tradition. Moving to Miami, California, and finally to NYC, Fabian went on to study jazz, composition, and film scoring at such prestigious institutions as New World School of the Arts, the Brubeck Institute, the Manhattan School of Music, studying and performing with such luminaries as Dave Brubeck, Kenny Barron, Christian McBride, and Jason Moran. Fabian has written several film scores and can be heard on several Spike Lee films as well as George Luca’s Red Tails among other films. Mr. Almazan was voted #1 Rising Piano Star in the Downbeat Magazine Critics 2014 Poll and was granted the Chamber Music America 2014 New Jazz Works commission. His solo albums, Personalities, which Fabian Almazan released on his own record label, Biophilia Records, and Rhizome [AritstShare/BlueNote Records] have garnered nationwide critical acclaim, including a glowing review in The New York Times. He has led his own ensembles at the Village Vanguard in New York City, broadcasted live to a nationwide audience on National Public Radio. Since 2007 Fabian has been the pianist for the Terence Blanchard’s various bands, including the E-Collective which was nominated for a GRAMMY in 2016. Mr. Almazan has toured North and South America, Asia, Africa, Australia and Europe extensively. Satoshi Takeishi, drummer, percussionist, and arranger is a native of Mito Japan. He studied music at Berklee College of Music in Boston, Massachusetts. While at Berklee he developed an interest in the music of South America and went to live in Colombia following the invitation of a friend. He spent four years there and forged many musical and personal relationships. One of the projects he worked on while in Colombia was “Macumbia” with composer/arranger Francisco Zumaque in which traditional, jazz and classical music were combined. With this group he performed with the Bogota symphony orchestra to do a series of concerts honoring the music of the most popular composer in Colombia, Lucho Bermudes. In 1986 he returned to the U.S. in Miami where he began work as an arranger. In 1987 he produced “Morning Ride” for jazz flutist Nestor Torres on Polygram Records. His interest expanded to the rhythms and melodies of the middle east where he studied and performed with Armenian-American our master Joe Zeytoonian. Since moving to New York in 1991 he has performed and recorded with many musicians such as Ray Barretto, Carlos “Patato” Valdes, Eliane Elias, Marc Johnson, Eddie Gomez, Randy Brecker, Dave Liebman, Anthony Braxton, Mark Murphy, Herbie Mann, Paul Winter Consort, Rabih Abu Khalil, Toshiko Akiyoshi Big Band, Erik Friedlander and Pablo Ziegler to name a few. He continues to explore multi-cultural, electronics and improvisational music with local musicians and composers in New York. Chris Dingman is a composer, vibraphonist, educator, and serves as Director of Creative Works for Inner Arts Initiative. He has received commissions from Chamber Music America and the Doris Duke Foundation, awards from Downbeat Magazine, and has been featured on NPR, in the New York Times, and many other publications. His music was featured as the WNYC hourly sonic ID for 4 years from 2011 to 2015. He completed a two-year fellowship at the Thelonious Monk Institute of Jazz where he received his Masters in Music from the University of Southern California, and he holds a B.A. from Wesleyan University. Dingman is currently producing the Dispatches from the Unknown podcast series for Inner Arts Initiative.